PLEASE NOTE: Doc Watson Book does not own the rights to any of these videos, and if they are offensive or violate copyright in any way, please be in touch here, and we will remove them. We have found these videos on YouTube or other video sharing sites, and are simply annotating them. Should anyone be interested in other videos they find on YouTube of Doc Watson, please be in touch, and we can post new videos and do our best to annotate them with dates, background information and more. 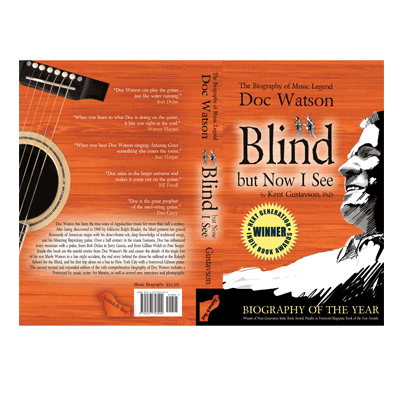 This is an educational page, and just a small window into the world of Doc Watson, music genius. For all of Doc Watson’s recordings, videos, and more, we have put a page together here. To listen to a song, click its heading in the list that appears below. You’ll be able to watch the corresponding video and read some (hopefully!) useful information about each song. Doc Watson, though asked by his manager Ralph Rinzler to boycott Hootenanny because of the folk singers’ boycott happening at the time, decided to do the show anyway. He played on live television in front of as many as 10 million viewers on the ABC network, while his family was still living in poverty in Deep Gap, North Carolina, before Doc signed a contract with a major record label, or made more than a few dollars for any concerts. The song “Deep River Blues” is of course one of Doc’s fans’ favorite songs, and combines the complexity of the Delmore Brothers’ original version (listen here), and of Merle Travis’ fingerpicking style (listen here). To find out more about the Hootenanny program, visit the Wikipedia entry here, and to find out more about Pete Seeger and his blacklisting that led to the folk singer boycott of Hootenanny, view the Wikipedia entry here. Clarence Ashley talks a little about his life with Clint Howard and Fred Price looking on. Tex Isley then accompanies Ashley on his most famous song, “The Cuckoo,” imitating the lines that Doc Watson used in his recording and performances with Ashley in the early 1960s. If Clarence Ashley hadn’t recorded this “’lassy-makin’” (molasses-making) tune in 1929, Doc Watson would never have been “discovered” by Ralph Rinzler in 1960. And the song had been an afterthought at the recording session Ashley had with Columbia Records… he simply	asked them if he could record a few “’lassy-makin’” tunes, and they agreed. The 78-recording made it into Harry Smith’s collection, and was released on his landmark record set for Folkways in 1952, called “The Anthology of American Folk Music.” There is a good deal of information on Anthology at its Wikipedia page here, it is still commercially available here, and there are 3 hour-long podcasts by Smithsonian-Folkways on the Anthology here, (as well as 21 other wonderful programs). “The Cuckoo” has been recorded by countless artists. Just search for it on your favorite search engine, and you’ll find many versions of the song. Most of them come from Ashley’s seminal version recorded solo on October 23, 1929. You can hear the original 78 recording in the Internet Archive, here. Fred Price sings lead in this version of “Daniel Prayed” from their appearance on Pete Seeger’s show “Rainbow Quest” in 1965. Doc sings bass and Clint Howard sings tenor. According to Ralph Rinzler, the group (re)learned the song from the “Songs We Love” hymnal (Stamps-Baxter, 1962) while preparing for a 1962 concert. In the Ralph Rinzler Folklife Archives at the Smithsonian Institution in Washington D.C., there is a facsimile of the copyright page and the hymn, number 32 in the hymnal. The hymn was composed by George Thomas “Dad” Speer, the head of The Speer Family, a group that became professional in the 1920s. For more about “Dad” Speer, visit the Wikipedia entry here. This song showcases the skills that Doc Watson had already developed on the flattop guitar by this point in his career, after a little over two years on the road as a solo performer. The interplay between Doc’s guitar and Price’s fiddle is what made the Clarence Ashley Group a hit in their early performances. Listen for the sinewy sound of Fred Price’s fiddle playing – It’s what drew Ralph Rinzler in, and the reason that Doc Watson ever became discovered. When Ralph Rinzler went down to the Union Grove Fiddler’s Convention over Easter weekend 1960, he didn’t meet Doc. After winning the band competition with his band the Greenbriar Boys, Rinzler walked around the convention listening to other groups rehearse and perform. He walked in on Fred Price’s fiddle playing on “Footprints in the Snow” and was immediately hooked. He had to know why Price was playing in an old-time style instead of a bluegrass style. When he sat down with Price to speak about music, Price and Clint Howard, the guitar player of the group, introduced Rinzler to Clarence Ashley, who Rinzler soon realized was the Clarence Ashley who was revered in New York for his version of “The Coo Coo Bird” and “House Carpenter” on the “Anthology of American Folk Music” that every folk musician in the folk music scene treated as if it were their bible. In any case, Fred Price first attracted the ear of Ralph Rinzler, who came down 5 months after he first heard Clarence Ashley, Fred Price and Clint Howard to record them in Saltville, Virginia over Labor Day weekend 1960. That’s when Ralph Rinzler walked into the room to find Doc Watson there playing his Fender Telecaster. Upset that Ashley didn’t want to play the banjo, and that he had brought this electric guitar player to the session, Rinzler hopped in his car and drove a few hours to find Jack Johnson, the banjo player who had played with Fred Price and Clint Howard at the Union Grove Fiddler’s Convention that spring. Lee Highway Blues is a fiddle tune attributed to old-time fiddler G.B. Grayson, who often played music with Clarence Ashley in the 1930s. Doc Watson learned this song from Pete Seeger’s 1957 record (listen here) that he was given Ralph Rinzler in the early 1960s. Rinzler first brought Doc Watson’s family a copy of Harry Smith’s Anthology of American Folk Music, and then subsequently supplied Doc with countless recordings to supplant his already vast knowledge of American folk music. Seeger learned the song from a Library of Congress recording. Both Pete Seeger and Doc Watson’s versions are pleasantly rubato; Doc’s with fingerpicked guitar accompaniment, and Pete’s with banjo plucking. Doc is playing the song on Pete Seeger’s program as a tribute to his older folk music playing friend. Halfway through this tune, Doc Watson takes the ripping kind of solo that astounded audiences from coast to coast in the early 1960s when he first hit the folk circuit with Fred Price, Clint Howard and Clarence Ashley. The blend of Doc’s guitar and Price’s fiddle is incredible, and the tight harmony of Doc and Howard’s voices is clean and very pleasing. This is the trio’s work at its best. Doc Watson had long since gone out solo by this point, since the end of 1962, but he did infrequent dates with Clint Howard and Fred Price, and at other times with his father-in-law, brother, or starting right around the time of this recording, with his teenaged son Merle. Clint Howard and Fred Price worked as farmers near Mountain City, Tennessee, and they would put everything on hold at home to go out on the road a few days a year with Doc. They were only with him on the road full time from 1961-1963, and they had mostly played folk music festivals and clubs such as The Ash Grove in Los Angeles. This is a video recording of a performance at the Seattle Folklore Society in 1967. The Doc Watson, Fred Price, Clint Howard trio had played a longer tour, and by this point, were Incredibly well-practiced, and played some of the most riveting music of their careers. A live recording of the concert is called “Old Timey Concert” (listen here), and features some of the hottest picking the trio ever did. Doc Watson also plays Scruggs-style banjo on the recording, though he has often denied ever knowing how to play bluegrass banjo in many interviews through the years. Clint Howard, in fact, remembers Doc practicing the style while they were staying at Ed Pearl’s beach house near Los Angeles – waking up early in the morning, sitting on the front porch of the cabana and teaching himself to play Scruggs-style. This song is a beloved song in folk tradition. Scott Reynolds Nelson’s book about John Henry is incredibly detailed, and a must read for any fans of the song and of folk music. Check out Nelson’s website for more information on the book. A.L. Lloyd was a good friend of Ralph Rinzler’s from Britain. He did an extensive interview with the Watson family in 1976, and part of that interview was released on the BBC. This brief segment comes from that. At the beginning of the segment, there is a still shot of Doc Watson watching in the background as young Bob Dylan sings “North Country Blues” at Newport 1963. The thunderous applause in this video clip says it all… Doc and Merle Watson had been riding a wave of enthusiasm since the release of the “Will the Circle Be Unbroken” album in 1972, and appealed to a wide audience. The addition of T. Michael Coleman to their duo in the early ‘70s and the electrification of their acoustic guitars helped bring them to a younger demographic, and the crowd here shows the excitement that Doc and Merle were able to bring onto stages across the country. “Tennessee Stud” of course was Doc Watson’s big hit on the “Will the Circle Be Unbroken” album, and guitar players across the country were learning to play it, amazed by Doc’s rock-solid guitar picking and incredible voice on the tune. As a side note, notice how tired Doc seems to be in this video (though his guitar chops are amazing). Doc had been on the road nonstop since 1963, and had been on the road with Merle for 13 years. He was 66 years old, and was still living out of a suitcase and hotel rooms, though he simply wanted to be home. He still enjoyed the road, but he started talking with Merle and T. Michael about retiring. He never quite got there… He’s still on the road at age 87, though not nearly as frequently as before. To find out more about the composer of “Tennessee Stud,” check out this video of Jimmy Driftwood, or go to Jimmy Driftwood’s Wikipedia or listen to his version of Doc Watson’s version of his song here. Doc recorded the album “Reflections” with Chet Atkins in 1979 in Nashville. The two guitar greats were both in guitar heaven. Chet had admired Doc from afar, and Doc had listened to Chet’s music since he was a young man, on radio and record. When they met up, it took little time for them to come up with a great set list of material, and they recorded their album “Reflections” in a few days. This performance shows the magic the two men were able to create together. Both of them focused on melody, line and simplicity, and used their virtuosity to create something magical. This is an incredible archival document. There are a few other videos of the two of them playing together, including one video of them playing backstage together. All of them are masterful. Doc recorded “I’m Gonna Lay My Burdens Down” on his 1991 album “On Praying Ground,” probably the finest album Doc ever recorded; his only completely gospel album, and thick with the sound of loss – the album was recorded only 2 years after Merle’s death, but only came out in 1991. It’s wonderful to hear Doc’s banter in between the songs on this one; he is clearly having a great time at this show. Merle’s fingerpicking and slide playing showcase his amazing talent and his subtle ability to back up his father’s playing. These three tracks are very exemplary of Doc & Merle’s sound in the late ‘70s and early ‘80s before Merle’s death. Doc tears up the Eddy Arnold tune “Just a Little Lovin’” (listen to the original here) – going back to his rockabilly roots to sing and pick this classic tune on live radio with T. Michael Coleman and Jack Lawrence, and the incredible fiddling of Johnny Gimble. This was less than two years after Doc had lost Merle, and this was the trio that toured the country until T. Michael left them to join the Seldom Scene in 1987. Then it was just Jack Lawrence and Doc Watson until around 2000 when David Holt started doing concerts with Doc as well. The second tune here, though the levels are off, is a brilliant duet between two of the guitar greats in the world – Doc Watson and Leo Kottke. A few weeks before Merle Watson died, he asked his good friend Jack Lawrence to take care of his father. Jack Lawrence did that for the next 25 years on the road and on stage. Here is a performance from early in their time together. Lawrence had an incredible ability to play inside of Doc’s guitar work. At times in this live version of “Tennessee Stud,” Lawrence’s playing almost seems to vanish, it supports Doc’s playing so completely. Lawrence believes that this era was the best picking that either he or Doc ever did, and it’s hard to argue with him. This is a wonderful video for guitar players to watch Doc’s left and right hands at the same time, but it gives the illusion that there are two Doc Watsons playing the song (which is how it sounds as well!) The quality of his voice on this song is also remarkable. This performance gives the listener the feeling of what it would sound like to sit in a room with Doc while he is singing and playing. The song “Blue Railroad Train” is a Delmore Brothers song. Listen to the original version here. “Black Mountain Rag” is Doc’s most famous flatpicking tune. Guitar players have learned the tune for generations since his Doc Watson’s first self-titled release on Vanguard Records in 1964 that included the tune. Listen to another version from around 1970 with Merle backing Doc here. Doc has spent the last decade alternating between concerts with David Holt and concerts with Jack Lawrence. David Holt recorded the album “Legacy” with Doc Watson which was awarded a Grammy. This is one of their early performances together for public television, before they worked on the “Legacy” project together. Doc speaks here about his wife Rosa Lee, and when he first met her. Doc was, of course, 8 years older than his wife, and he met her when she was only 14 years old, so the lyrics to this song are indeed apropos to his life. He has now been married to Rosa Lee for well over 60 years, so something must have worked right. Doc’s work with David Holt has returned him to more of the mountain and folk music that he did in the early 1960s before he went out on the road with Merle. This tune showcases Doc’s brilliant ability to accompany other musicians. His playing here is incredibly tender behind Grisman’s mandolin. And such a sweet solo here. Here are two more tunes with David Grisman from the same concert: Sweet Georgia Brown, and In the PinesM. In the Pines was the first tune they ever played together, during Doc’s first two-week long solo engagement at Gerde’s Folk City at the end of 1962, when David was just a teenager. This trio of musicians put together some incredible sounds in 2003 when they joined together and sang old-time and bluegrass tunes. Ricky Skaggs self-admittedly was sitting in for Bill Monroe, the great mandolinist. That would have been the true 3 greats of acoustic music, Scruggs on banjo, Doc on guitar, and Monroe on mandolin. But Scruggs does a masterful job sitting in. Richard Watson is Merle Watson’s son, and often tours with his grandfather Doc. He is a competent guitar player, and gives his grandfather a lot of comfort on stage, having Merle’s boy in the seat next to him. Jeff Little is a local piano player and friend of Doc’s. The three of them have a great time at the local Wayne Henderson Music Festival, playing rockabilly of the kind that Doc has been playing for more than 60 years on local stages in the same area. There are many recordings of Doc playing this song; it has been a favorite on stage for him since the early 1960s when he would dust the song off during guitar workshops at various folk festivals. Doc is playing a guitar made by his friend Wayne Henderson in this clip. He has played countless guitars over the years, and Doc’s blessing on an instrument is a religious experience for any great luthier. Henderson is certainly a great guitar-maker. Doc Watson knows more songs than he could ever play on stage, and here, he pulls out a song that he seldom has played in public, “Tellin’ My Troubles to My Old Guitar.” (Listen to Chet Atkins’ version here). SOURCE: Bristol Rhythm and Roots Reunion Concert, Tennessee. This is a beautiful version of this hymn. As an incredible testimony to Doc’s deep piety and emotion while he’s singing, listen to the entire hymn, and you will hear at around 2:40, that Doc nearly breaks down crying. Listen to the lyrics he is singing. He is truly feeling those lyrics, and thinking of his own pain, and the pain of his son… You can hear it in his words. Doc truly has the ability to express his emotions through his voice. Doc plays Johnny Cash’s legendary tune for the first time on stage with serious attitude. The crowd loved it for obvious reasons. Doc even got the guitar groove right. Brilliant cover tune from 86-year old Doc Watson. SOURCE: August 22nd, 2009 Todd, North Carolina Concert. No caption necessary. This is a powerful testimony from a deeply devout man. Click here to listen to Randy Travis’ version of the song “Doctor Jesus” that Doc speaks about in this clip.